Poultry producers and caretakers are required to euthanize animals in their care from time to time in order to end animal suffering and distress. Euthanasia may be required due to animal health concerns, monetary concerns or an inability to properly care for the animals in question. A properly designed and implemented on-farm euthanasia program demonstrates compassion for the animals and will help to address public expectations for enhancing poultry welfare. For any euthanasia technique there are pros and cons, and the ultimate decision about what is the right technique for any farm lies with the producer/ caretaker in consultation their veterinarian. The categories of current euthanasia technique options for Canadian poultry producers include: cervical dislocation, blunt force trauma, non-penetrating captive bolt, electrocution, gas based euthanasia (such as CO2 gas) and decapitation. It is important to verify death after performing euthanasia on any animal. Indicators of death include the complete absence of reflexes, the cessation of breathing, the absence of a pulse or heart beat and complete muscle relaxation. If using a physical method or rapid induction of anoxia irreversible brain failure can be concluded to occur at the time when convulsions cease. Death will also occur from the destruction of the brain itself (Ref. 2). Prepared as information for Alberta Agriculture and Forestry, funding for this project was provided through Growing Forward 2, a federal-provincial- territorial initiative. The views and opinions expressed in this report are not necessarily those of Agriculture and Agri-Food Canada or Alberta Agriculture and Forestry. Regardless of the euthanasia technique employed on a poultry farm gentle handling and restraint of birds is required to accomplish humane euthanasia. Handling and restraint for manual cervical dislocation of broiler chickens is described in the Chicken Farmer’s of Canada On Farm Chicken Euthanasia Guidelines Version 1.0. More research, development and commercial availability of appropriate poultry euthanasia restraint devices and techniques is needed. Examples with pictures of easily implementable euthanasia restraint devices and techniques are given below. 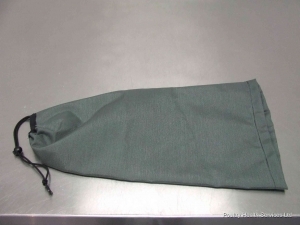 A method that is compatible for use with manual cervical dislocation, mechanical cervical dislocation, blunt force trauma and captive bolt guns is the use of a fabric sleeve. 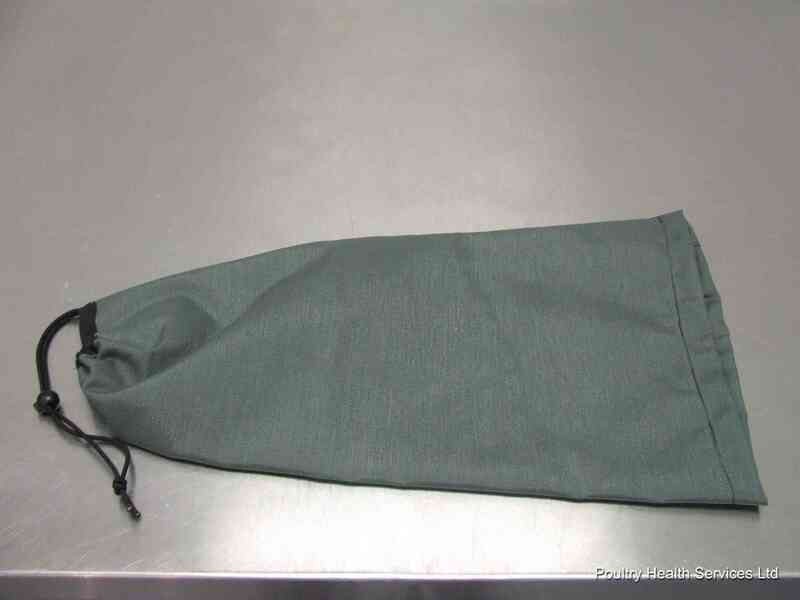 A picture of a fabric sleeve appropriate for poultry euthanasia produced by Poultry Health Services is shown below. Fabric sleeves can be sized for different sizes of poultry. A method of euthanasia restraint compatible with blunt force trauma and captive bolt gun use is the use of a portable restraint box. The method as applied to turkeys is pictured below. Construction of such a box is simple, with plastic containers big enough to contain a bird modified to allow access to the head of the bird. The box is held down by the knee or by a helper and the neck is stabilized with one hand while the euthanasia is performed by the other. This procedure involves using a captive bolt gun to irreversibly damage or destroy the brain of the bird to be euthanized. Kinetic energy damages/destroys the brain, rendering the bird instantly insensible. 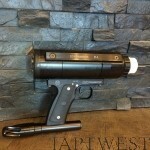 Captive bolt guns powered by charges, pressurized air or cartridges are available. Captive bolt guns are an acceptable euthanasia method for large poultry. 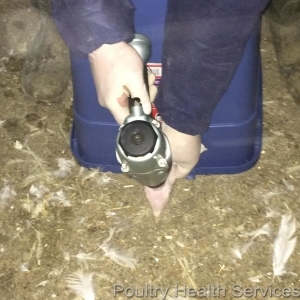 Captive bolt guns may too powerful for use on certain types of poultry such as chicks or poults. Commercially available devices are described in the Euthanasia Devices section. This procedure involves severing the head of the bird from the body. Decapitation should be executed with a sharp instrument, ensuring rapid and unobstructed severing of the head from the neck. Use of a bleeding cone may facilitate restraint. Decapitation is an acceptable euthanasia method for poultry of all types when performed by competent personnel. There is no nominal cost associated with decapitation. This procedure involves providing electric current through the body of the bird to either stun the bird (head stunning) which is followed up by a secondary method to kill the bird or to directly kill the bird (head to heart stunning). Electricity passes through the head and heart of the bird causing stunning (by disrupting the cerebral cortex) and rendering the bird dead by disrupting normal body functioning. 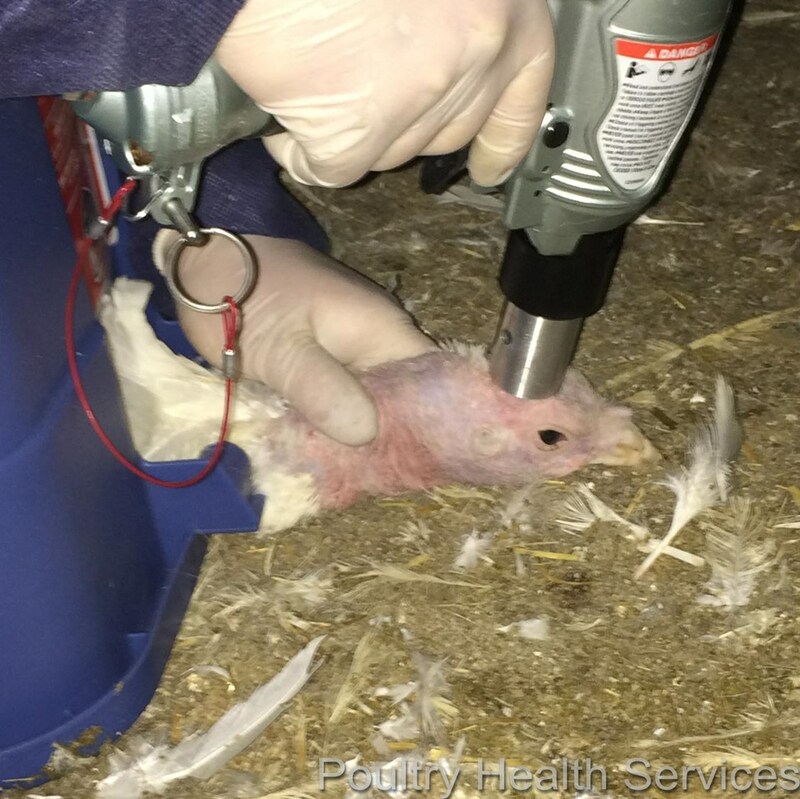 Electrocution is an acceptable euthanasia method for poultry of all types. Devices for on-farm euthanasia by electrocution are in development. Home-made solutions may be ineffective or unsafe, so be cautious in their use. This procedure involves controlled changes in the gaseous atmosphere surrounding an animal such that the animal loses consciousness due to lack of oxygen or excess of carbon dioxide, depending on the atmosphere. Purpose built CO2 euthanasia equipment is an effective method for euthanasia of poultry of all types and sizes. This procedure involves striking the animal on the top of its head with a heavy, blunt object, such as a hammer. The blow must be administered swiftly, with determination and firmly enough to ensure quick, humane euthanasia on the first attempt, rendering the bird dead. Blunt force trauma is an acceptable method for chickens and turkeys. It is acceptable to use any heavy blunt instrument, such as a large hammer or heavy pipe to perform blunt force trauma. There is no nominal cost associated with blunt force trauma. Cervical dislocation involves stretching and separating the vertebrae in the bird’s neck rendering it insensible followed by death. Cervical dislocation can be applied manually or mechanically. 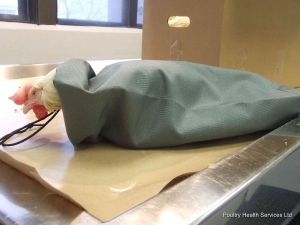 Manual cervical dislocation of broiler chickens is described in the Chicken Farmer’s of Canada On Farm Chicken Euthanasia Guidelines Version 1.0. Cervical dislocation is an acceptable method for chickens and turkeys. There is no nominal cost associated with manual cervical dislocation. Neuromuscular spasms, convulsions and seizures occur with physical methods of euthanasia and during abrupt hypoxia. Generally these reactions are not associated with consciousness, and can be an unconscious process. The phases of a bird’s response to physical methods of euthanasia include the clonic phase and tonic phase. During the reaction of a bird to physical euthanasia methods the order of phases may differ across species and method. The clonic phase involves uncoordinated (sometimes violent) wing-flapping, kicking, flopping and paddling motions of the limbs. The tonic phase involves rigid extension of the limbs and wings. Electrical stunning causes grand mal seizure characterized by tonic then clonic phases. Blunt force trauma, non-penetrating captive bolt and cervical dislocation immediately result in a clonic phase followed by tonic muscle spasms. Clonic phase reactions often include violent wing-flapping, followed by a tonic phase including rigidity, stretching of legs, opening of wings, feather erection, and cloacal relaxation. Emotional effect on observers and operators. Compatibility with subsequent evaluation, examination or use of tissue. Compatibility with species, age and health status (works for ALL sizes of poultry). CO2 in high concentrations can be an irritant to poultry. Safety for predators/scavengers should the carcass be consumed. 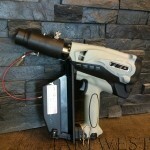 The TED is a re-engineered nail gun designed as a one-step non-penetrating captive bolt gun. TED stands for “Turkey Euthanasia Device”, but can be used on a variety of other species. 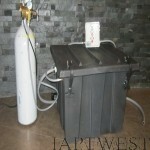 The TED is powered by a butane fuel canister that will provide 1,000 shots/canister. 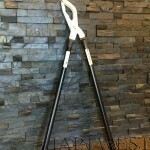 It is completely portable, light weight and easy to handle. The TED can be used to euthanize full grown turkeys, ducks, chickens and pigs up to and including 9 kg (20 lbs). 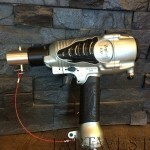 The Tomahawk is a re-engineered paint ball gun designed as a one-step non-penetrating captive bolt gun. 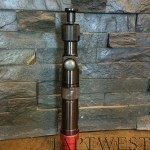 The Tomahawk is powered by a CO2 fuel canister that will provide several shots/canister. It is completely portable, light weight and easy to handle. The Tomahawk can be used to euthanize chickens and full grown turkeys up to 50 lbs. The EuthaneX Box causes controlled changes in the gaseous atmosphere surrounding an animal such that the animal loses consciousness due to lack of oxygen and/or excess of carbon dioxide. The CPK is a cartridge powered non-penetrating captive bolt gun that is designed to euthanize poultry in one step. The CPK2 is powered by a .22 calibre 1 grain cartridges that will provide one shot/cartridge. It is completely portable, light weight and easy to handle. The CPK can be used to euthanize chickens, turkeys, ducks and geese. The Zephyr is a re-engineered nail gun that was developed for use in rabbit abattoirs. Further research has been conducted to validate the Zephyr for use on turkeys and piglets. When fired, a nylon bolt head is ejected from the barrel. Through concussive force the Zephyr causes brain damage and immediate insensibility followed shortly by death. The Zephyr is powered by connecting to a standard air compressor charged to 120 PSI. The gun has been proven effective for the euthanasia of poultry. Other considerations to consider are that the Zephyr requires an air compressor hook up, hoses and restraints (not included in purchase price). The Koechner Euthanasia device is a mechanical device to assist in performing cervical dislocation. The device is placed around the neck of the bird. When the hammer is directly upon the base of the top of the neck and perpendicular to the head, the handles are brought quickly together until a “pop” is felt; meaning that the neck has been dislocated. Livestockwelfare.com: Canadian Farm Animal Welfare Resource Centre. Canadian Virtual Centre for Poultry Welfare. Bock Industries Animal Welfare Division (Zephyr-EXL and TED devices – includes videos showing how to use non-penetrating captive bolts for poultry euthanasia). Guide to on-farm stunning and euthanasia of specialty poultry and barnyard fowl. Ministère de l’Agriculture, des Pêcheries et de l’Alimentation. 2008. Mason C et al. 2009. Methods for dispatching backyard poultry. Veterinary Record. 164: 220. Turner, PV and Doonan G. Developing on-farm euthanasia plans. Canadian Veterinary Journal. 51: 1031 – 1034. Southern Poultry Science Society (SPSS) and USDA, 2007. Bioethics Symposium: Proactive Approaches to Controversial Welfare and Ethical Concerns in Poultry Science.